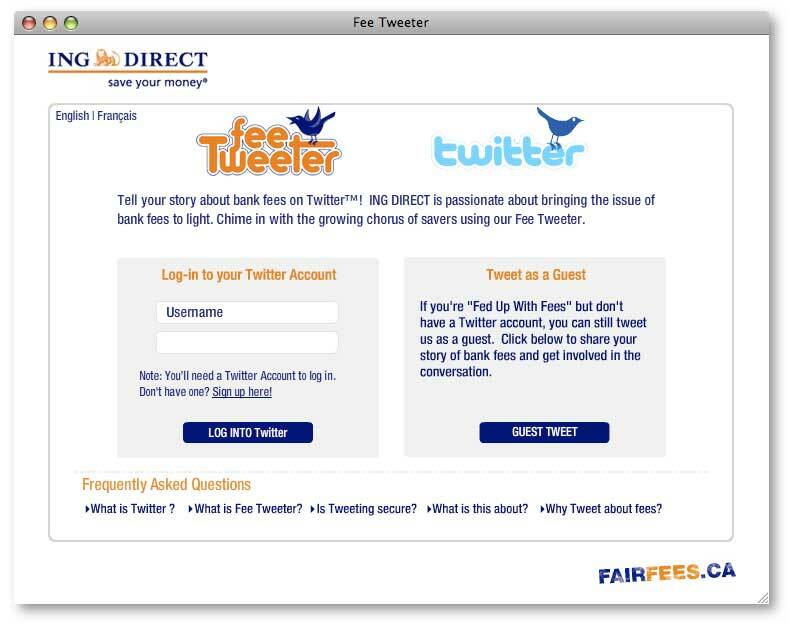 ING Direct in Canada has launched Fee Tweeter, a new Twitter application that will automatically track and tally bank fees. The project is a new component of the fairfees.ca initiative previously covered by The Financial Brand. Send a tweet from ING Direct’s Fee Tweeter account on Twitter announcing the fee. Tally the fees. The Fee Tweeter application will keep track of how many fees you’ve shared with ING Direct, and send you a weekly message with the total you’ve been charged so far. ING Direct also keeps a cumulative total for all fees shared at its Fee Tweeter website, $19,296 thus far. 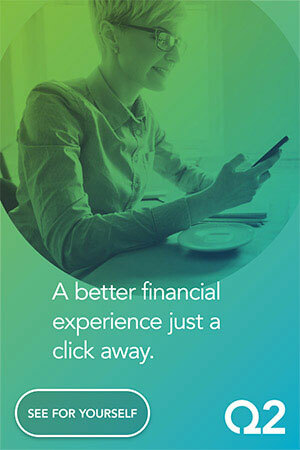 Includes a running tally of all fees shared with ING Direct. The Financial Brand was unable to logon to the Fee Tweeter application in two attempts. The third attempt was successful, however. Seeing what other people are paying in bank fees doesn’t sound very interesting, but ING Direct’s FeeTweeter account on Twitter has over 400 followers nonetheless. 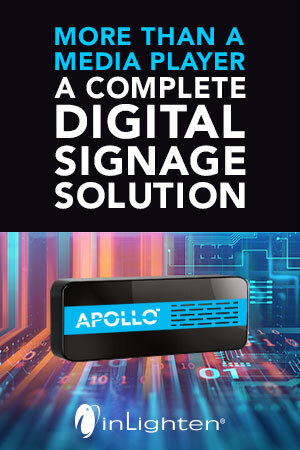 the company will broadcast it via Twitter. 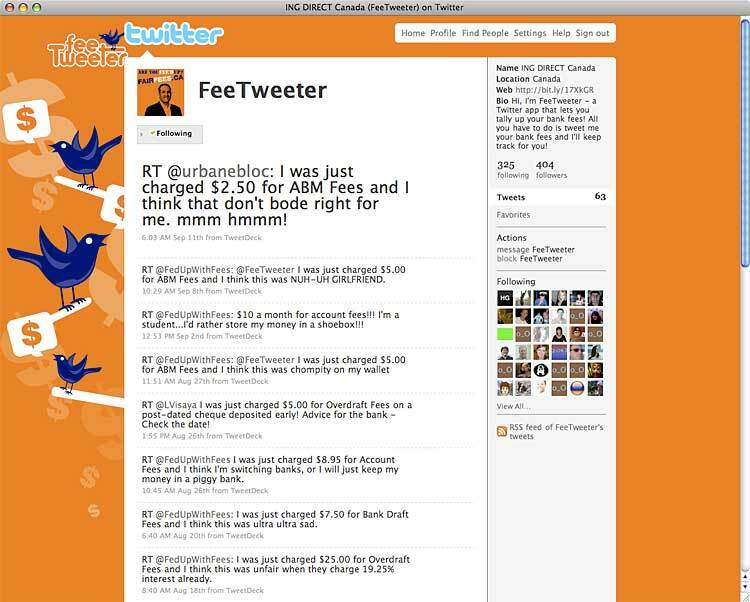 ING Direct modestly claims to (A) be the first bank in Canada to (B) launch a Twitter application that (C) tracks fees. In all likelihood, they are the first bank to launch a Twitter application — period — not just the first in Canada, nor just the first that tracks fees. How does this initiative “connect people” with one another? 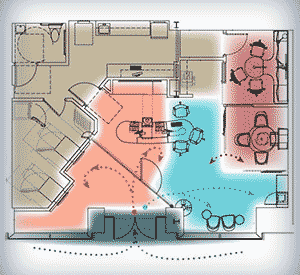 How many people will be willing to take the time to use this website? How many times will someone be willing to do this? “The tool is basically an easy and fun calculator to help Canadians keep track of their fees,” Gloria Chik, an ING Direct spokesperson, told The Financial Brand. “We don’t have fees at ING Direct,” Chik added. This article was originally published on September 15, 2009 . All content © 2019 by The Financial Brand and may not be reproduced by any means without permission.